Today being a traditional day of disguise and deception, i’ve been mulling our current political situation. Can our leaders not hear what they’re saying or read what they’re writing? Like a couple of days ago our self-confessed serial liars General Keith Alexander, director of NSA, and James Clapper, Jr., the director of national intelligence, claimed that they had not collected tens of millions of phone calls by French and Spanish citizens. And then immediately admitted that they were in possession of these phone calls. Apparently it depends on how you define “collect”. And San Francisco’s very own Senator Diane Feinstein, AKA “Big Sister” – who has been eloquent on the need for the NSA to collect every syllable American citizens utter, every character they type, every Internet search they make – yesterday condemned our spying on German Chancellor Angela Merkel. Frankly, as a loyal American citizen, i kinda wish it were the other way ’round. And our drunken Roman Catholic Archbishop, when questioned on what he would do after the Supreme Court struck down California’s ban on gay marriage, responded that the Church must always oppose laws when they teach an untruth and gave as an example laws promoting racial discrimination. Hmmm, apparently His Grace forgets that his Holy Church promoted and perpetuated the enslavement of Africans and Native Americans in the Americas for centuries when the Spanish conquerors needed expendable workers to build the missions, till the fields, and dig in the mines. Or our President, who could say with a straight face, “Nobody is listening to your telephone calls.” when he knew full well that what they were doing was saving all your calls to databases so they could do a search on you and sift through everything you’ve said for the last few years. No, those in power can never hear themselves…and the count on the American people’s inability to remember what their leaders said last month. 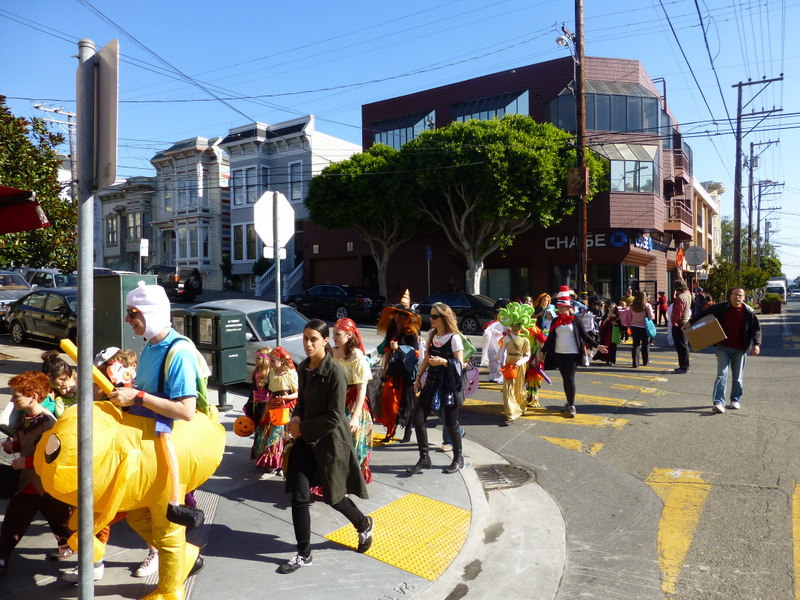 On a lighter note, it’s a gorgeous Halloween day, and i rode out this morning to deliver a jar of hot-off-the-stove Piquant Peach Chutney to my benefactor Bernie in Noe Valley and timed the excursion just right to catch the late morning bands of trick-or-treaters going up Noe Street. And of course we do have to give back, so here’s a shot of the photographer taken by a kind bystander. 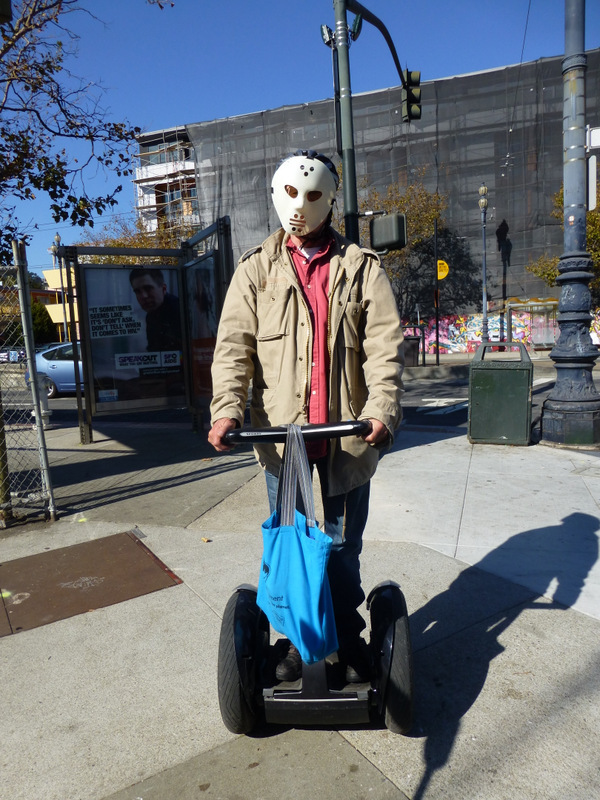 The pity is that when i was riding i had that mask tipped back on the helmet, and the wind lifted it off without my noticing. Damn, i coulda worn it when opening the door tonight for trick-or-treaters.